The only changes between Halifax and The Promise are switching out the gin for spiced rum (of course) and reducing the amount of simple syrup, both directly added to the drink and by not poaching the pears in syrup. Since rum is inherently much more sweet than gin, I felt safe moving away from some of the added sweet. Even though this was the first thing I tried, this was so pleasant and drinkable that I didn’t go any further. The only addition I made to this recipe after the first tasting was to add a thick garnish of lemon. Without it, this drink can be a little too sweet, at least for my taste. Though slight, the freshness and tang of the lemon peel helps keep this drink balanced. 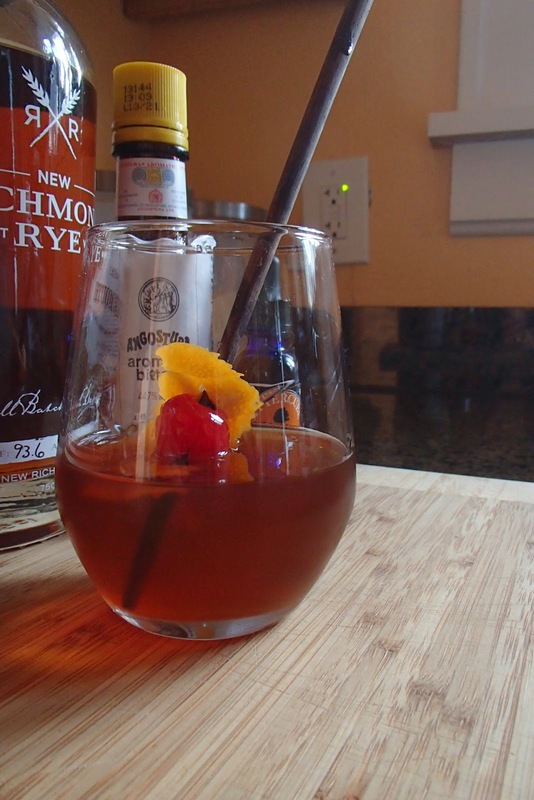 There were plenty of other good drinks entered into this contest already when I submitted the Halifax Spring, so I didn’t think my chances were good. But then, after a long day knowing I was in the top three entries, Halifax Spring was declared the winner! And I have to admit, it feels pretty good. I’ve only been exploring the world of craft cocktails for a little over a month. 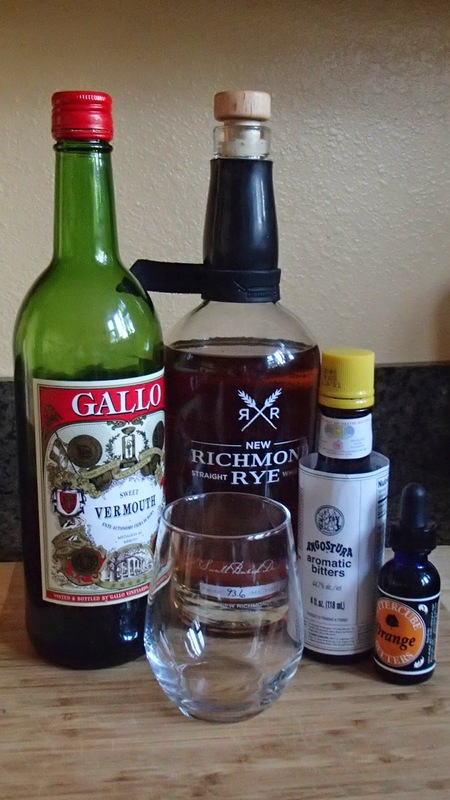 I’ve barely begun to learn how to make different things and what flavor profiles different spirits, bitters, and ingredients have and how they interact with each other. But it’s good to know that I’m on the right track with some stuff. I feel much more motivated now, and let’s see if I can crank out more than just one post per week from here on. And I’ll have some amazing spiced rum to work with as well. Thank you all, dear readers, for your support so far. 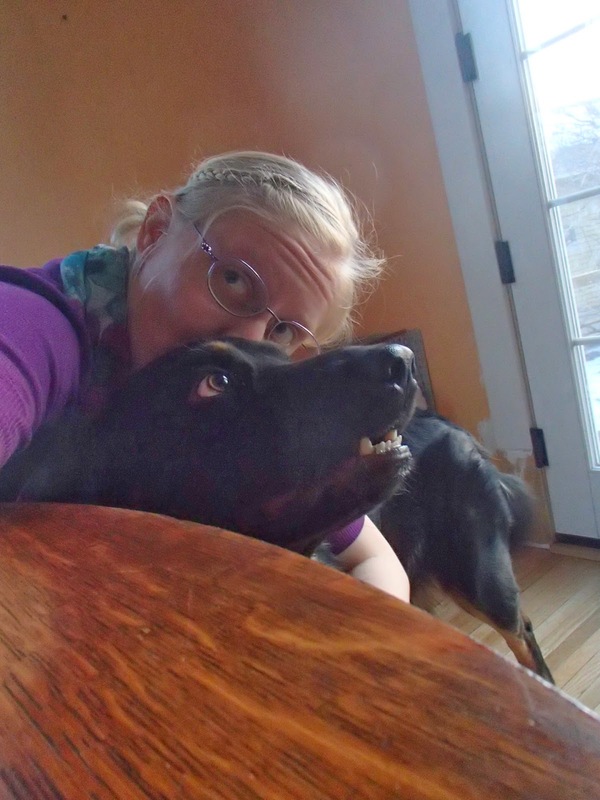 I know this blog is still rather sparse and plain, and I have a lot of content to add still. But we’re growing, and this is an excellent sign that I’m moving in the right direction. Follow the blog that hosted the contest on twitter @BehindTheCraft or at their website, www.behindthecraft.com. As for the distiller, follow them on their facebook at https://www.facebook.com/LyonDistilling or on their twitter @LYONDISTILLING . *: In the future, I think some sort of spiced syrup (ginger, clove, or cinnamon, depending on the inherent flavors in your rum of choice) would add a little more complexity to this cocktail. 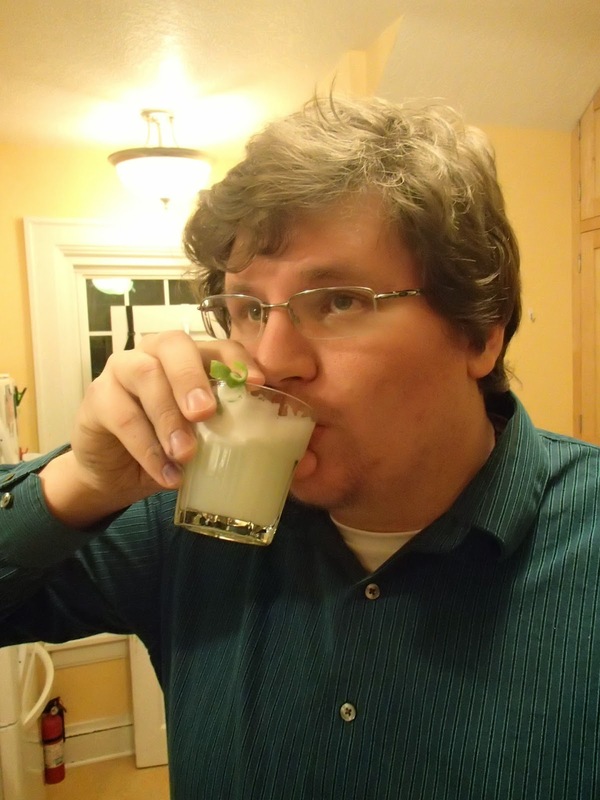 This week’s cocktail was originally going to be the White Lady, which is 2 parts gin, 1 part lemon juice, 1 part orange liqueur, and optional egg white. 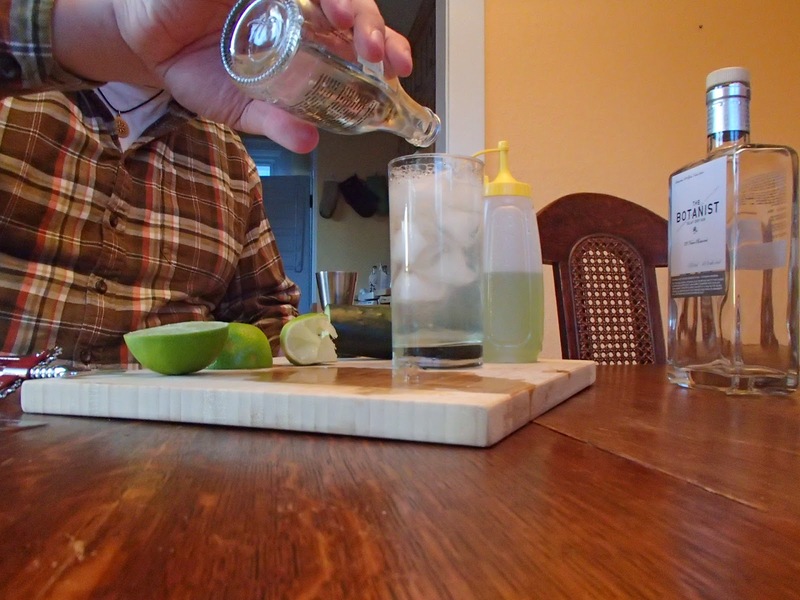 But, since it’s basically the same thing as the Pegu Club I made in my first post, I decided to nix that and experiment a little. Don’t get me wrong, the White Lady is amazing. I think the lemon blends with the orange liqueur better than the lime, but that’s purely personal preference. 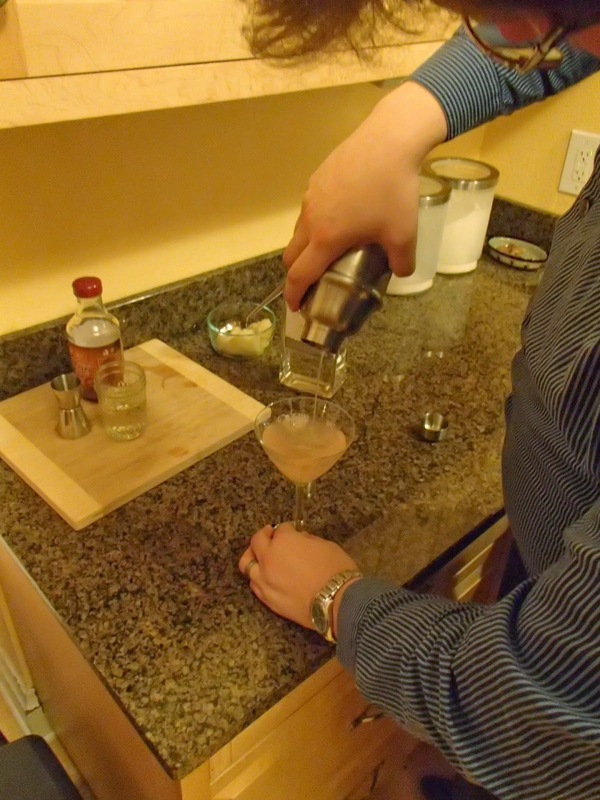 So, be sure to try the White Lady and the Pegu Club and let me know which one you think is better! 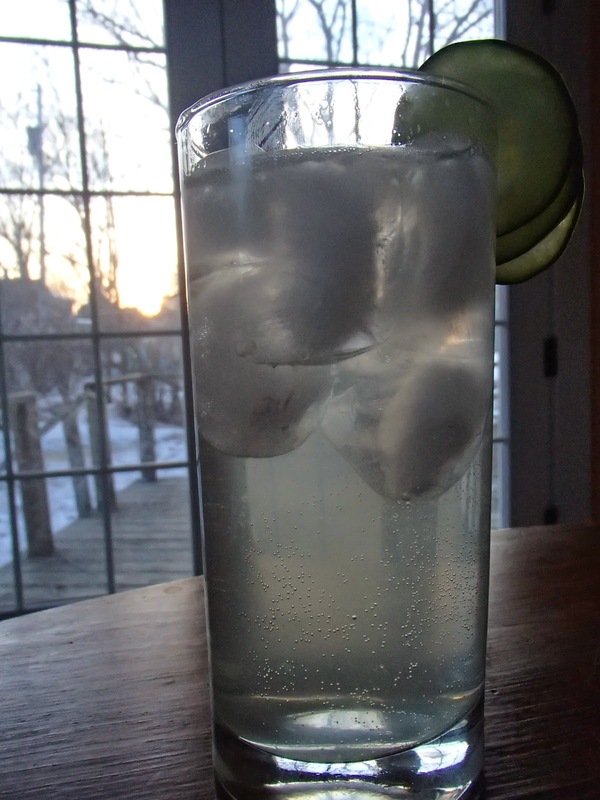 All right, onward to this week’s feature drink: the Promise of Spring! …okay, so that name’s a little pretentious, but it was the first I could think of, and I couldn’t find this cocktail anywhere else. With spring (hopefully) coming soon, maple trees being tapped all around me, and a little tropical fruit to remind me that warmer months are ahead, I thought the name was apt. If you’ve got a better one, leave it in the comments. I’d love to hear it! The first step is to cook the pears. I cooked one diced pear in 1.5 parts water and 1 part sugar. If your pear is extremely ripe, you may not need to cook it, but this way you get a delicious pear simple syrup for use in future dishes and drinks, so I recommend it. 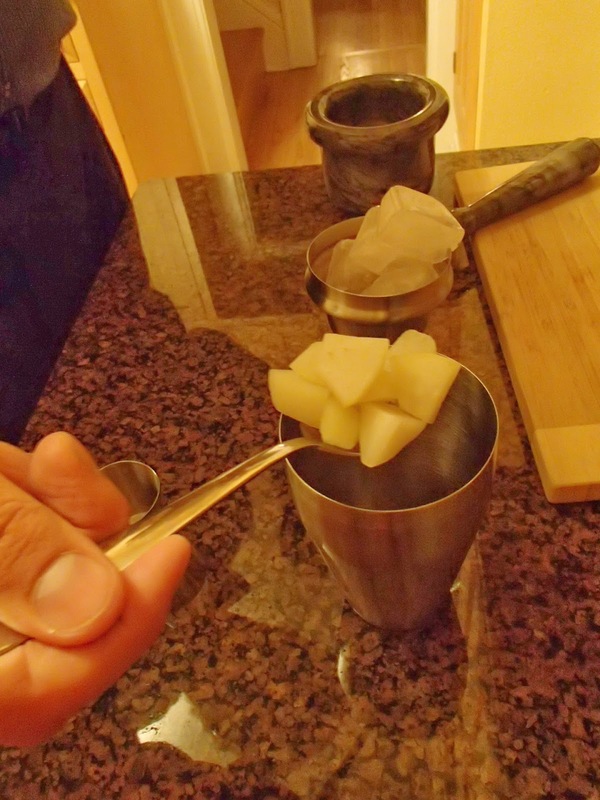 Once the pear is cooked and subsequently cooled, place a spoonful (fine, if you want a slightly more accurate measure, about 1/4 of a pear) in your shaker and add the 0.5 part simple syrup. Now, we muddle. 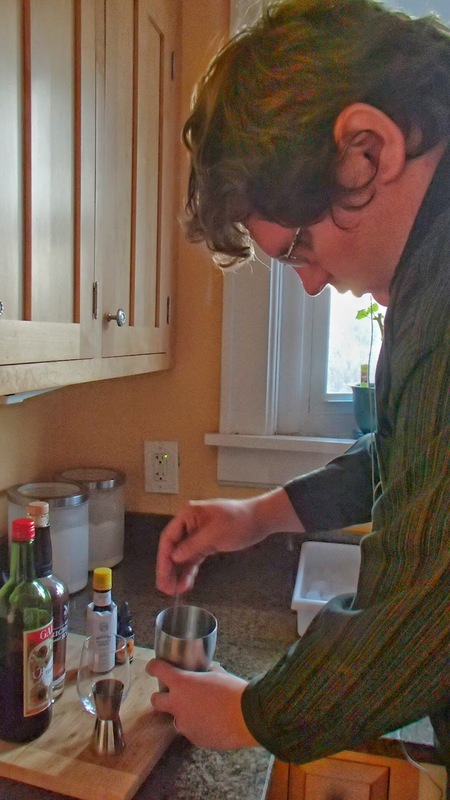 I’ll write a separate article on muddling in the future, but I’ll sum it up here: muddling is pulverizing an ingredient in a liquid to release the flavors. 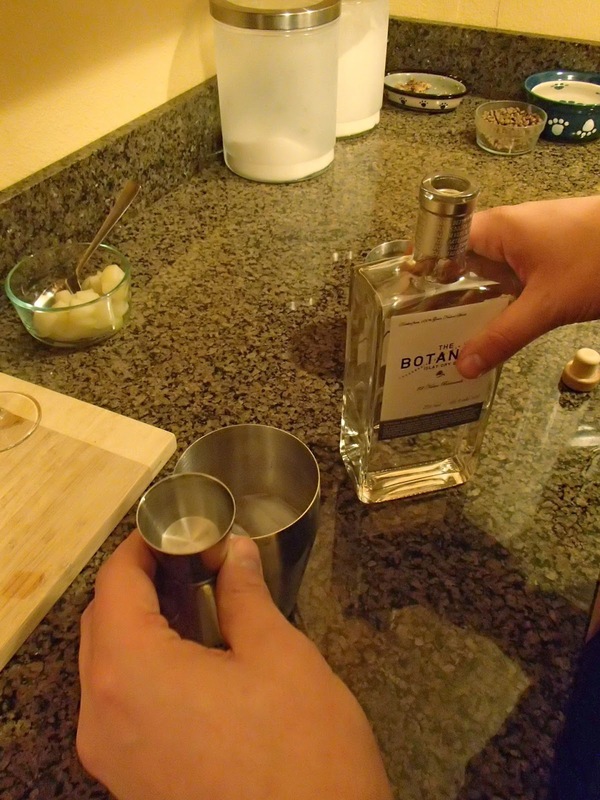 After muddling, the solid ingredient is usually shaken with the rest of the cocktail, then strained (unless you’re going for the rustic aesthetic). In this case, make sure you pummel the pear good, but you don’t need to actually puree it by hand. Next, add the grapefruit juice, gin, and a dash (i.e. a few drops) of maple syrup. Be careful with the maple syrup – it’s a very overpowering flavor, and unless you plan on eating pancakes with this, a few drops are enough. Then shake. 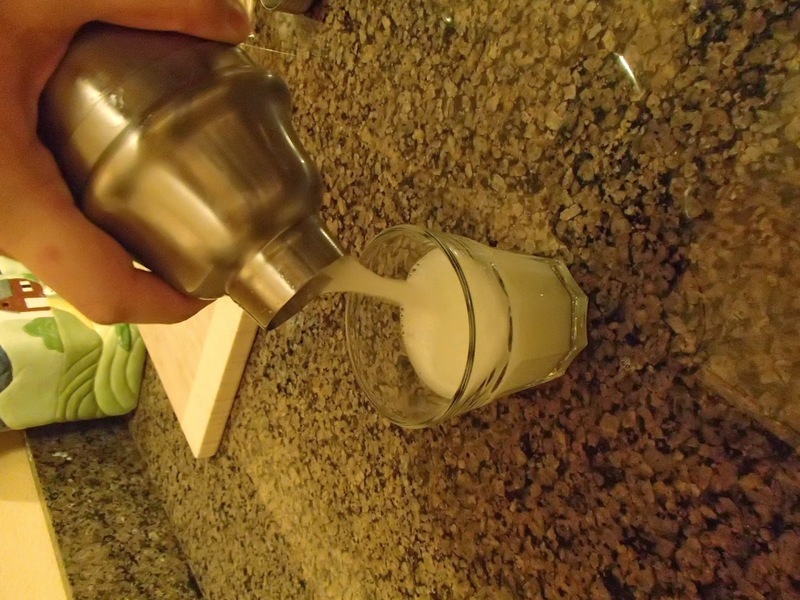 I’ll do an article or video on how to properly shake a cocktail in the future as well, but to quickly sum it up: you’re shaking the drink to mix the ingredients, cool the drink, and slightly dilute the drink. 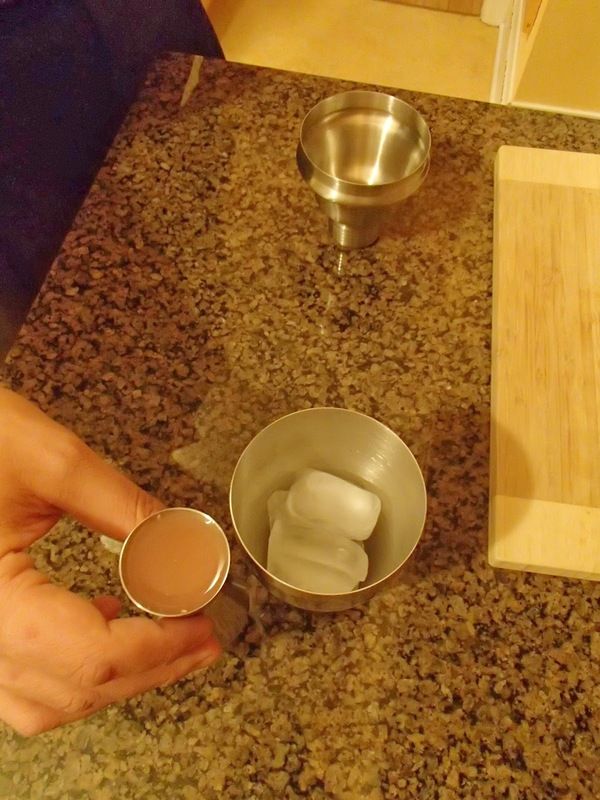 As you shake the drink, the ice will both lower the liquid’s temperature and chip, putting more water into the drink. This is a variable that can be manipulated to change the consistency of a drink. But as a general rule, you only need to shake a drink for 5 seconds or so. Don’t forget to glare at the drink while shaking it. When you’re done shaking, strain the cocktail into your glass of choice. Garnish with a few pieces of your cooked pear, and enjoy! The Promise of Spring exceeded my expectations in every way. Each flavor makes itself known, but none of them overpower any of the others. 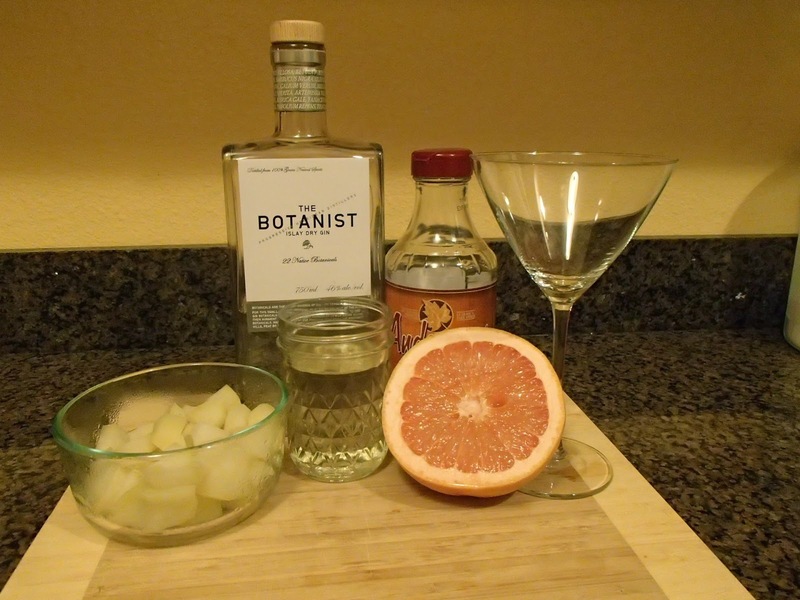 While very sour, the grapefruit is complimented well by the more neutral sweet of the pear, allowing the other flavors inherent in the grapefruit to come through, along with the herbal notes of the gin. The maple syrup binds everything together and gives it depth. This cocktail is, overall, slightly more sweet than sour. But, because the sweet enhances the sour rather than extinguishes the sour, I don’t mind it at all. If you make a Promise of Spring for yourself and/or a friend or two, let me know what you think of it either in the comments or at alex@stagandotter.com! Heimdall insists you try this drink for yourself! The Pegu Club cocktail originated in Burma as a slice of British imperialism: something served to colonial businessmen and military officers at the Pegu Club on the outskirts of Rangoon. 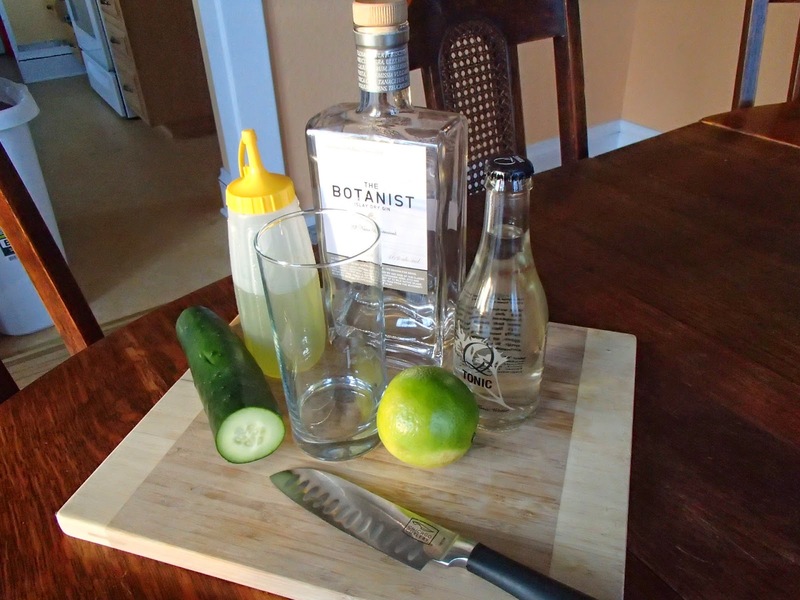 The original recipe called for 2 ounces London dry gin, 3/4 ounce orange curacao, 3/4 ounce lime juice, 1 dash Angostura bitters, and 1 dash orange bitters. 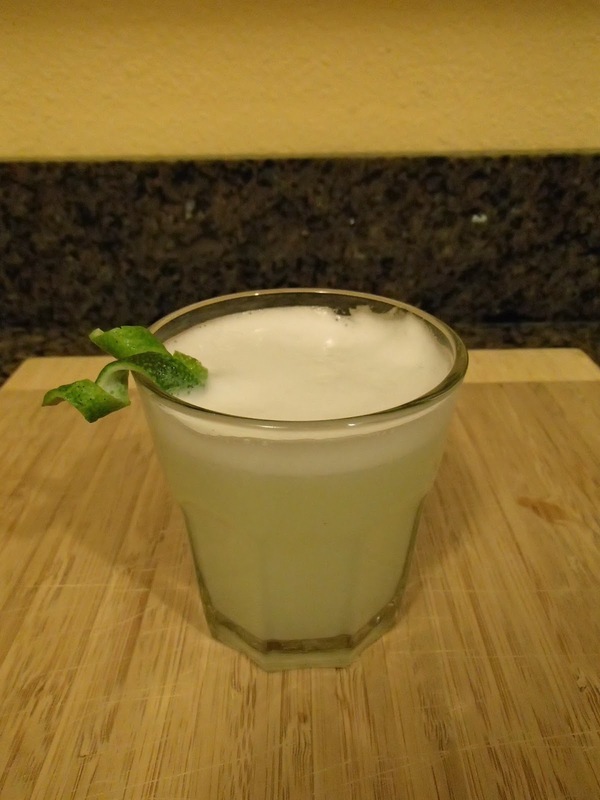 Since I don’t have the orange bitters yet, I decided to cut the lime and gin with egg white instead. Much like the foam on top of your cappuccino, egg whites in cocktails add volume to the drink, creating a creamy texture that helps cut the acidity of the lime by incorporating that acid into it’s foam structure. For more on the science behind this, read this article. 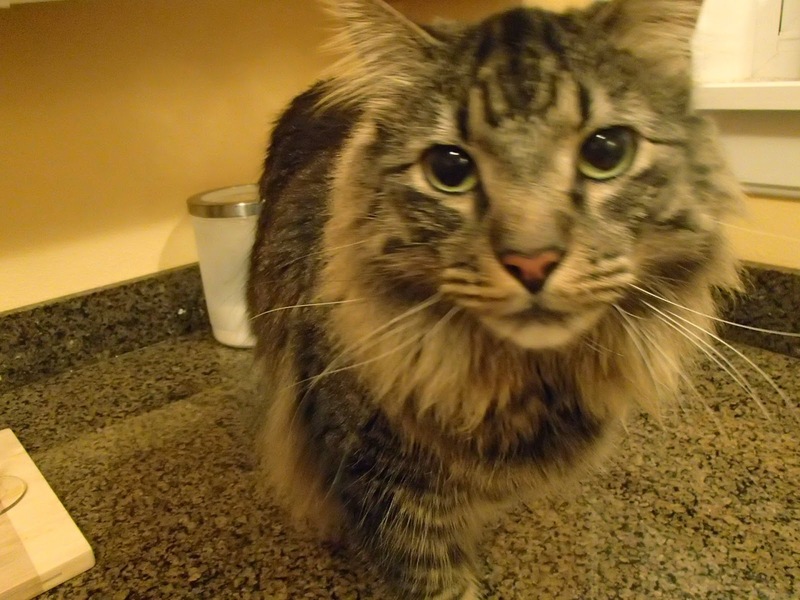 Our cat, Heimdall, decided he wanted to join us. 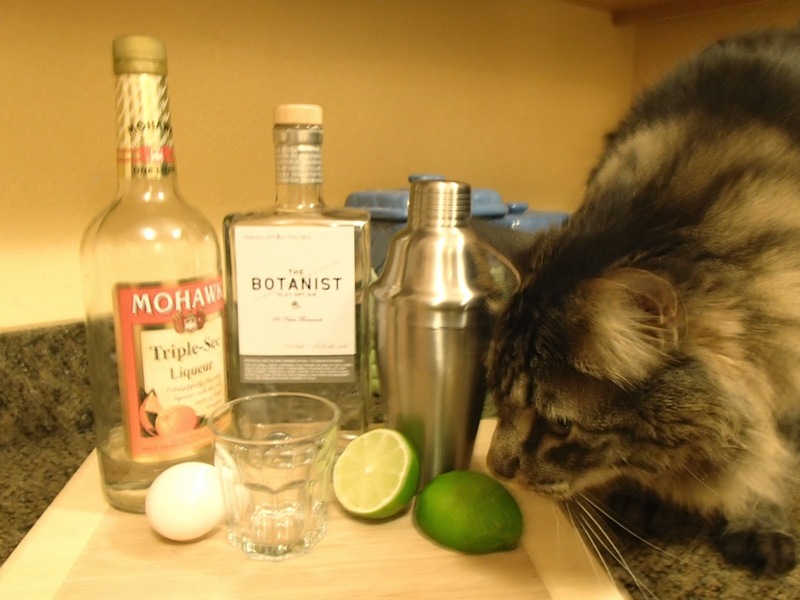 Do not add cat to the drink. Combine all ingredients except the ice in a shaker. Shake vigorously for a few seconds until a nice froth forms. 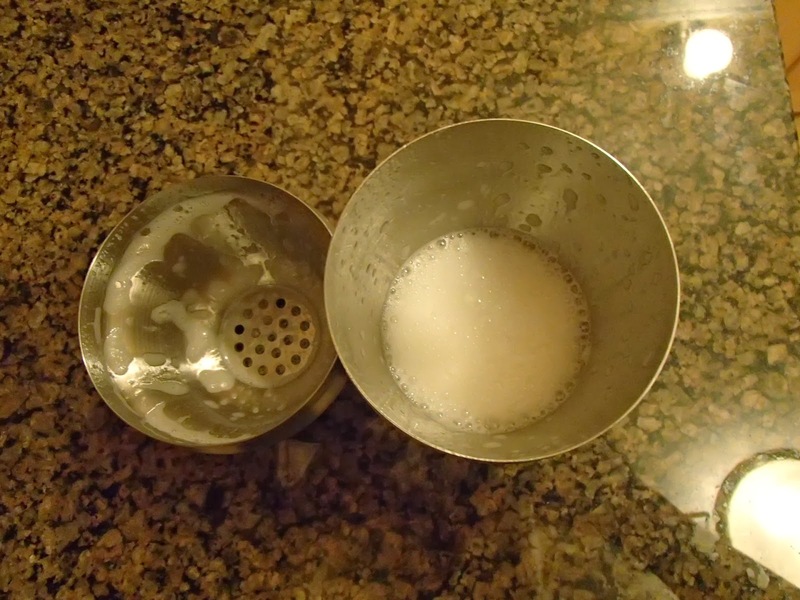 Add ice and shake again, but gently this time to preserve the foam, until a little condensation begins to form on the outside of the shaker. Strain into a glass and garnish with a lime twist. 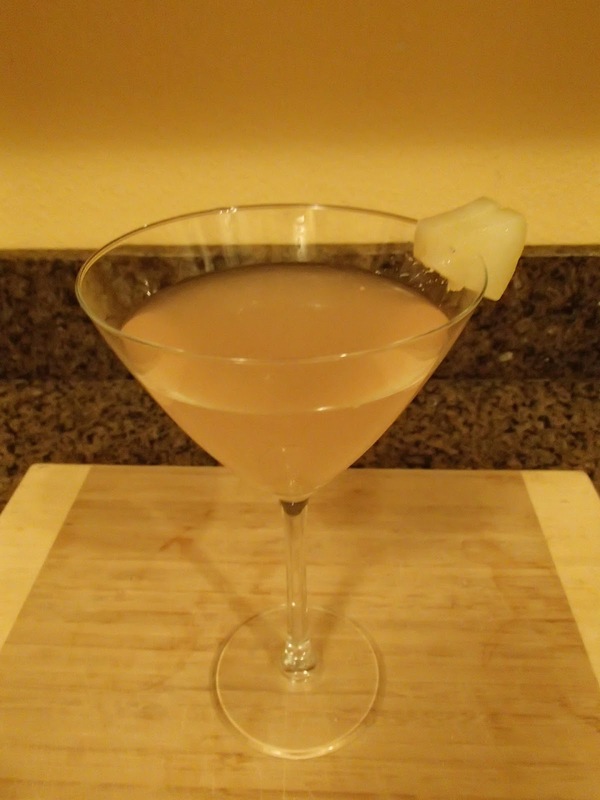 This Pegu Club variant is very tasty. Lime and gin is a classic combination, and it doesn’t disappoint here. The acidity of the lime brings out the herbal notes in the gin, and the addition of the egg white cuts the acidity and gives the Pegu Club a smooth texture. This cocktail evokes the warm clime of Yangon (f/k/a Rangoon) where it was developed, even though it’s a frozen wasteland here in Wisconsin. 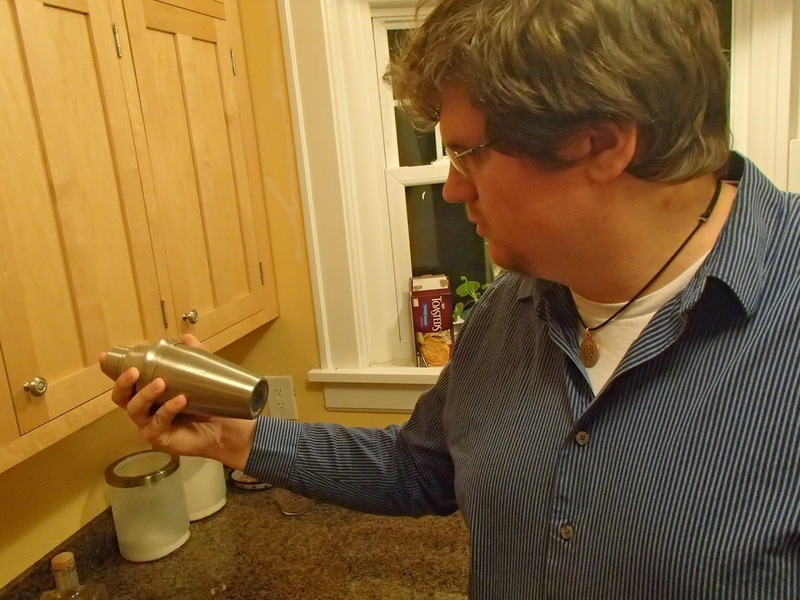 Since I made this drink, the temperatures here have been on the rise, and the Pegu Club may very well be the reason. There you have it, folks. Beat the polar vortex; make yourself a Pegu Club. I can feel the snow melting already! 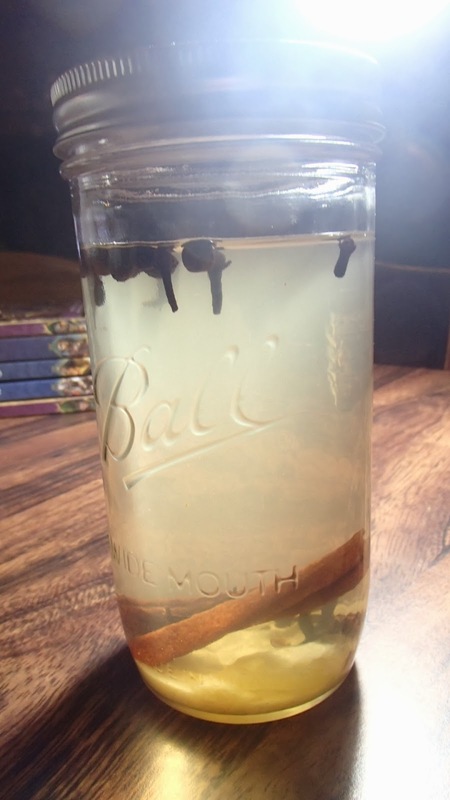 Next week: the White Lady and a Tropical Anise Infusion! Looks like things may be changing a bit here. With my new-found desire to post more consistently, I wanted to update the look of the site, and I couldn’t do that on Blogger. So we’ll give WordPress a whirl. A new platform brings new challenges. Over the next few weeks, everything should continue to work. But it may not. If it’s not working, feel free to leave a comment or, if you can’t, shoot me an email at alex@stagandotter.com, and I’ll try to fix it right away. I’ll also be moving previous posts, and some of the old formatting may temporarily be messed up. Thanks for your patience as I settle into the new platform, and here’s to a year filled with tasty drinks and new experiences.